For years I have been wanting to participate in the annual outdoor sculpture exhibit at Maudslay State Park here in Newburyport, MA. This is a community art celebration, with work by artists of all ages and levels of experience. With the Spirit Book Series finished and my work feeling like it is transition, this year seemed to be the perfect year to try. Translations I: Inner Movement is the result. This past winter/early spring, I took a class in Chinese brush painting at the Newburyport Art Association with Bruce Iverson. I didn't make it to all the classes but learned several things. One is that I probably don't want to do Chinese brush painting or calligraphy at this point in my life. Although I spent years totally absorbed in the study of Western calligraphy and loved the hours I spent at my drawing board trying to both perfect letterform and write with a lightness of touch, I am in a different place now. I have had a taste of making work that comes more completely from inside of me. However, I did reconnect with my love of ink and paper. The feeling of both excitement and contentment that comes from bringing brush to paper was deeply felt in the classes and I wanted to continue that relationship. In my calligraphy days, I put letters on everything- tshirts, pottery dishes made by my friend Sandra, kitchen tiles- as well as envelopes, cards, and fine art pieces. As I walked through Maudslay thinking about the sculpture show, I got that same itch to bring my rediscovered love of ink and paper into the world around me. I've always been fascinated by the Japanese custom of wrapping rope, shimenawa, around trees and went back and looked through my collection of books about Japan, Japanese culture and Japanese art. I originally started with the idea that I would make banners that hung from trees but could not figure out the logistics. 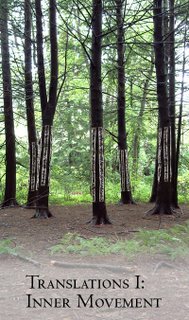 I decided to tie long strips of paper with ink drawings to the trees. I did my first tests on a tree outside our fence and along the street. I tested one of my favorite papers from Bhutan and it made it through several rains without a problem. The paper is made from the long fibers of the Daphne plant and is quite strong. The sumi ink from Japan is waterproof. I used to use it for calligraphic signs and a store had one in their window for years with no fading. Because I wanted the work to be as much about nature as possible, I decided to use pieces of fallen sprays of hemlock leaves and cones gathered from under the trees instead of a brush. Here's what I wrote in the proposal: "Standing among the tall trees, I feel their spirit. I gather sprays of needles and cones and bring them into my studio. Dipping the sprays in ink, I make marks on paper. 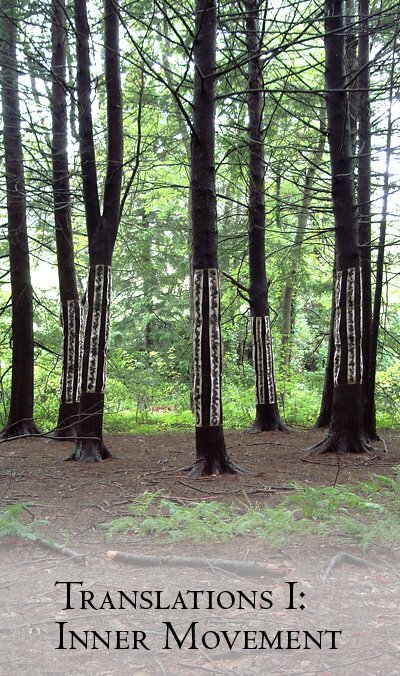 The papers are sewn onto cord and brought back to Maudslay where they are tied around trees. The movement of the ink brings to the outside the trees' inner life. At the close of the exhibition, the papers will become books celebrating the installation." The work was installed on Sunday June 5. I hope it will be the beginning of a new series. The exhibition continues through June 25 with a Reception and Tour on Saturday, June 10 from 3-6 PM. Park hours are 8:30 am to sunset.